You are currently browsing the category archive for the ‘Urban Design’ category. Beginning March 9, the Department of Buildings will begin posting diagrams of new buildings or major building enlargements on its website for public review. The public will have 30 days to comment on these drawings, which will depict the size and scale of new building projects. Initial Public Challenge Period: When DOB approves plans for any new building or major enlargement, the building diagrams, called ZD1 forms, and other associated documents will be uploaded to the DOB website. In addition, once a permit is issued builders will be required to post the permit at the location within three days so the public is aware of the proposed development. New Yorkers will have 30 calendar days to review and challenge the development approval. Initial Zoning Challenge Review: After the initial public challenge period ends, the DOB Borough Commissioner will address every challenge by conducting a full review of the construction plans and rendering decisions that will be posted online. If a challenge is determined to be valid, appropriate enforcement action will be taken, including issuing Stop Work Orders, revoking of permits, and requiring redesigns of the proposed construction. Community Appeals Period: If the Borough Commissioner determines that a challenge is invalid, the public will be given an additional 15 calendar days to appeal to the First Deputy Commissioner. Final Zoning Challenge Review: Once the First Deputy Commissioner issues a determination, the decision may be appealed to the Board of Standards and Appeals for a final determination. What do you think? Will this be an effective tool for communities to monitor development projects? According to the article, the City’s Department of Transportation and Economic Development Corporation will hold a hearing on Tuesday, November 18 to collect ideas for the site. The meeting will take place at 5pm at St. Francis College (180 Remsen St., between Court and Clinton streets, room 6301). Call 718-222-7271 for info. 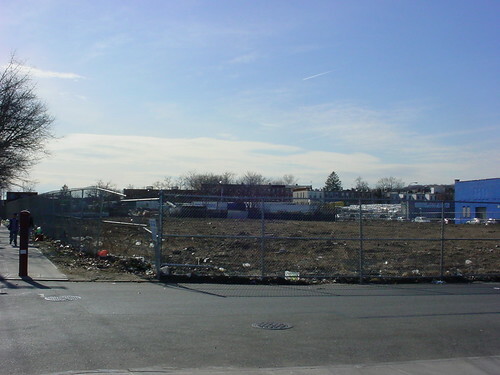 City Room reports today on an audit by Comptroller William C. Thompson’s office, which cites the Department of Sanitation for “disorganization and mismanagement” in its program for cleaning up vacant lots. So what can communities do to counteract this problem? In Philadelphia, which has had a major vacant property problem, with an estimated 30,000 to 40,000 vacant lots downtown in 2006 according to Philadelphia Weekly, the Pennsylvania Horticultural Society’s Philadelphia Green program has created a manual, Reclaiming Vacant Lots: a Philadelphia Green Guide. This manual is geared toward city agencies, community-based organizations and block associations, and outlines a basic “clean & green” approach to managing vacant land, including clearing debris, planting grass and trees and installing fences. It also provides information on settling ownership issues, developing a site plan, and creating a long-term maintenance strategy. Check it out! Prospect Lefferts Gardens blog Hawthorne Street has news about an upcoming meeting about the redesign of the southeast section of Prospect Park, including changes to the dangerous Parkside Ave./Ocean Ave. intersection, and the construction of a new Lakeside Center. This “green” facility will replace Wollman ice skating rink with two new rinks that will be used year-round: ice skating in the winter, and water features, movies, and community events in warmer weather. To give your input on the plan, you can attend the meeting Monday night, May 19 at 6:30pm at Wollman Rink. In addition, PLG Public Works, a group working to improve public spaces and streets in Prospect Lefferts Gardens, is looking for volunteers. He examines 10 methods for street improvements, from creating permanent play streets and bicycle boulevards, to creating a “green grid” on Manhattan’s busiest streets. The article mentions three community-based plans: the Brooklyn Waterfront Greenway, Ninth Avenue Renaissance, and vision42, all of which will be included in Planning for All New Yorkers, an Atlas of Community-Based plans, set to launch online next week. Cocktails at 6:00 p.m., Remarks at 6:45 p.m.
on 212-935-2075 or reserve your place online now. …Rumor has it there will be valet bike parking. 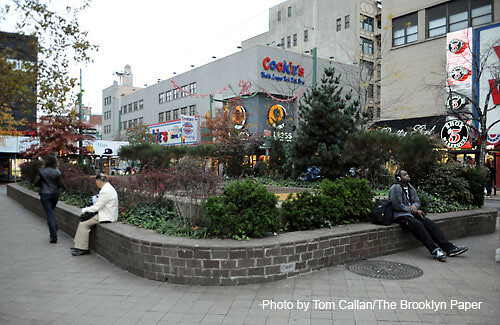 Photo of Gansevoort Plaza via Project for Public Spaces. On January 11, 2005 I started a wiki entitled BeyondVoting. The intent was to explore how the many new governance tools being experimented with around the world might help improve governance here in NYC. First I created a wiki-home page where I introduced the subject. Next I created and linked to a New Tools for Democracy page with the intent of providing a space where the city’s “governance community” (an exclusive club that includes all city residents) might review these new developments, gathered from around the world, and decide which of these creative initiatives might be worth trying in our wonderful city. After some development time, it dawned on me that it would be helpful to match specific local governance limitations with these “New Tools” and, giving it a positive spin, began an Opportunities for Change page. I focused on Community Boards, a domain I was particularly familiar with having been an active Community Board member for 12 years at that point. That page soon grew to have 30 “Opportunities,” and somewhere along the way of matching “Tools” to “Opportunities” my optimism took a hit and I started thinking that perhaps I was going too fast; that applying these “New Tools” to Community Boards was folly; that one needs to learn to walk before one can run. Must Read from Treehugger.com: Can U.A.E. Build a Truly Sustainable City? We’ve been living in our New York City bubble as usual of late, but now and then stories come along that remind us there is some truly massive development going on in other parts of the world as well. Particularly in the United Arab Emirates, where they build entirely man-made islands, including this newly-planned, Rem Koolhaas-designed island, which will “simulate the density of Manhattan” and feature a decidedly Death Star-like hotel. Another plan in the works in UAE is Madsar City, “a $22 billion initiative to build a brand new, zero-emissions city for 50,000 from scratch in Abu Dhabi.” (Rendering from Norman Foster’s Foster + Partners shown here). Yesterday, sustainability blog Treehugger.com posted a not-to-be-missed roundtable discussion with some leading thinkers on planning and sustainability about this project. A sample question from the discussion: “What kind of city will Masdar be? Based on the material that has come out in the press, Masdar would appear to be an extremely commercialized city populated by imported foreigners and totally disconnected from its local surroundings. Is this sustainable?” The panel has some great insight in how to (and how not to) create a sustainable city. Check it out. While the National Park Service’s Draft General Management Plan for Governors Island does include plans for rehabilitation and preservation of the structure, under the NPS plan, the site would instead become the Governor’s Island History Center or Harbor Center, an educational center focusing on the site’s military history. The 60-day public comment period for the Draft General Management Plan ends March 18. What do YOU think should happen to the site? The New Globe Coalition has created an online petition that supporters can use to send their comments to the NPS. Those wishing to contact the NPS directly can also do so here. The American Institute of Architects has withdrawn its controversial proposal for seven zoning text amendments. Many community groups and community boards throughout the city opposed the amendments, both because they would have altered regulations for contextually-zoned neighborhoods, and because of the lack of community process that went into their creation. It’s in a taxi, it’s on the streets, it’s in your neighborhood, but how does urban design impact your life? Meet some of the players who shape the city—and your experiences—during this lively conversation exploring the intersection of design, innovation, sustainability, and accessibility in New York’s public realm. Deborah Marton, Executive Director of the Design Trust for Public Space, will lead a discussion with panelists Andrew Salkin, First Deputy Commissioner, NYC Taxi and Limousine Commission; Davin Stowell, CEO and founder of Smart Design; Susan Chin, FAIA, Assistant Commissioner, Capital Projects, NYC Department of Cultural Affairs; Mary Ceruti, Executive Director, Long Island City Sculpture Center; and Ryan Russo, Director of the Bike and Pedestrian Planning Unit of NYC Department of Transportation. Co-sponsored by the Design Trust for Public Space. To register, call (212) 534-1672, ext. 3395 and mention the Campaign for Community-Based Planning.